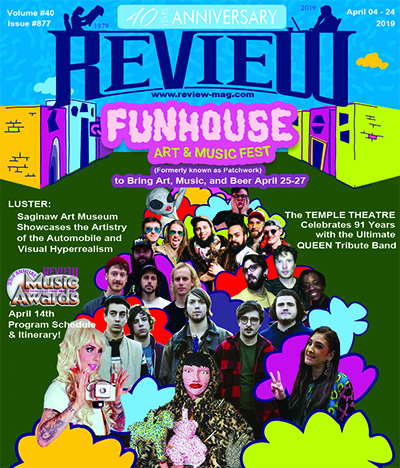 The 27th Annual Review Music Awards was held on Sunday, April 21st at BARTS in Bay City. Below you can find the total number of nominees in each division, the top five nominees, and the winner in each division. Results were determined through a two-tiered nomination and final voting round that ran from January through March, 2013, and was ascertained by over 7,000 registered voters. Nominees & Winners are either based out of the Great Lakes Bay area or perform regularly within the area. The Critic's Choice Awards were determined by a panel of 12 music journalists, club owners, and those knowledgeable with the music scene in the Great Lakes Bay area. Look for complete coverage on the 27th Review Music Awards, interviews with top artists, photos from the evening's celebration and much more in our Music Awards Special Edition, which will be out on May 8th.